Tank juggling illustrates the fine line that online gamers constantly dance across, both knowingly and unknowingly. On one side is the legitimate use of exceedingly effective game mechanics to gain an advantage; on the other is abusing a mistake in the programming. That line could be erased with a simple statement from the developers, but those clear statements are few and far between. Instead, players most often learn of the developers' intentions through patches or disciplinary action. That was the case with the phenomenon of achievement servers in Team Fortress 2. When the game's first class update went live, it included a number of items that players could unlock by earning a number of Medic-specific achievements. These achievements took into account your previous play history and, as a result, they were far easier for veteran Medics to complete than neophytes. Being a new player around that time, I knew that there was no easy way for me to accumulate the one million heal points needed for one of the achievements. That's why achievement servers were such a godsend. Achievement servers were places where groups of players would get together for the sole purpose of helping each other earn those difficult class-specific achievements. I knew that my actions were not entirely innocent, but I was following the school of thought that said it was better than the alternative (i.e. playing at a disadvantage because I didn't have access to the new weapons). One day, I bumped into a friend from another game on a public server. He had been playing TF2 since its release, and his main class was the Medic. He only had a few achievements left to complete before getting the final weapon. Looking to help him out, I offered to meet him in an achievement server. His reply caught me completely off guard and forever changed the way I thought about achievement farming: He flat out called me a cheater. 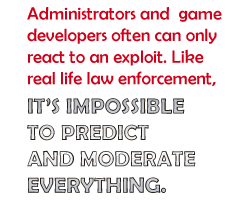 Administrators and game developers often can only react to an exploit. Like real life law enforcement, it's impossible to predict and moderate everything. If players want to benefit from a fair and evenhanded community, they must undertake some of the responsibility by interpreting and assessing the rules themselves. They cannot blindly assume that just because a tactic is allowed by the software, they can take advantage of it.